HTC 10 smartphone gets 7.0 Nougat Updates in india. 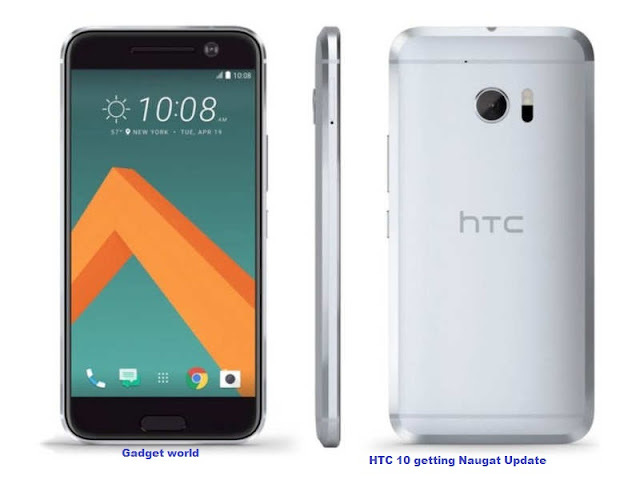 HTC 10 Smartphones getting Android 7.0 Nougat update in India. As per media reports the update takes the phone's software version to 2.41.400.5. The Latest update, brings along features such as multi-windows support and improved Notification panel features. The 5.2 inch HTC 10 has Qualcomm Snapdragon processor with computing speed of up to 2.2 Ghz. It has 32GB internal memory and supports external storage of up to 2 terabyte or about 2,000GB. Loaded with multiple sensors, it supports features like gesture controls, voice selfie, motion detection, among others. The phone comes with 3,000 mAH battery and promises talk time of 27 hours on 3G or 4G network. The phone has all the latest wireless connectivity option from bluetooth, near field communications (NFC) to DLNA, Miracast. It promises download speed support of up to 450 mbps and upload speed of 50 mbps on 4G network. With the OTA update now started, it could be a bit of time before it reaches operator variants and other countries, but at least you know that the wait shouldn't be too long. In any case, check your device's settings for an update and try to be patient... as much as possible. And finally, the older HTC One M9 seems to also be invited to the Nougat party with a 1.27GB OTA, according to user.